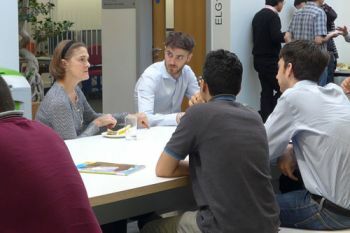 The Turbulence and Flow Control Group in City’s Centre for Fluid Dynamics organised a Mini-Symposium on Flows over Non-Smooth Walls. 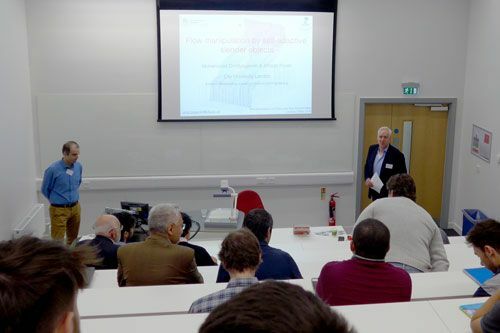 On 9th May 2016, City University London’s Centre for Fluid Dynamics hosted a Mini-Symposium on ‘Flows over Non-Smooth Walls’. Organised by Dr Mohammed Omidyeganeh and Professor Alfredo Pinelli, the full day of presentations in the Mini-Symposium featured the research of world-leading scientists in their respective fields. The ability to understand, control, and manipulate the flow over surfaces by passive or active elements is in great demand from researchers and within engineering and manufacturing industries .The range of interest and possible applications ranges from the design of aircraft wings, poro-elastic cover on ships, vegetation in rivers, and cilia cover on ependymal cells in human bodies. The presenters at the event were: Professor Christoph Bruecker, Professor Alfredo Pinelli and Dr Mohammed Omidyeganeh (City); Professor Alex Bottaro (University of Genova, Italy); Dr Shervin Bagheri (KTH, Sweden); Professor Heidi Nepf (MIT, USA); Dr Ricardo Garcia Mayoral (University of Cambridge); Professor Javier Jimenez (Polytechnic University of Madrid); Dr Bharathram Ganapathisubramani (University of Southampton); and Dr Julien Favier (Aix Marseille Université). A consortium of researchers on Flows over Non-Smooth Walls has also been formed. Fluid dynamics is a sub-discipline of fluid mechanics that deals with fluid flow - the natural science of fluids (liquids and gases) in motion. It has several sub-disciplines itself, including aerodynamics (the study of air and other gases in motion) and hydrodynamics (the study of liquids in motion).